Bacon Ranch Pinwheels are the perfect Keto friendly or low carb lunch or snack. Instead of being wrapped in bread like traditional pinwheels, these are wrapped in sliced meat! With these Bacon Ranch Pinwheels it is easy for to change things up. 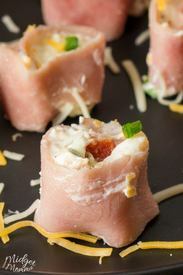 You can use salami, ham or turkey when making the keto pinwheels and they still taste amazing.